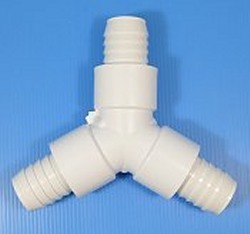 High Pressure (up to 300psi) 1.25" ribbed barb True Wye. Custom made product. This is a large fitting (about 7" Square) Sorry, no returns on this item. Color of the barb may be Gray or White. Made in the U.S.A.